of President Jergensen of the house of Des Moines 7th Branch. 3 For your fellowship in the gospel from the first day until now. during the reign of President Jergensen. unto him and they all needed to fit within. in the boarders of the land Illinois. unto us of this great man. 8 How is it that one should leave and another not take his place? Wherefore another was called from the plains of Billings, Montana. and wild corn plants of great height and polyester ties. and did have many posterity. 12 And it came to pass the mission did wax strong. but in boxes and e-mails. are sent to you for my support. be perfect for service at Brother Cluff's house. season have washed it away, and lo I desire to plant again. "Remove", and it was removed...slowly. as we asked T to pray and waited on our knees, and she prayed. 22 May my love be unto you all, amen. Last week, as we were destined to conquer the urban mountain, we approached the summit of its marble outcropping with zeal and stratagem. Dressed in suits and dismounted name tags for camouflage, we quickly avoided the security at post. Jumping into the elevator, it only went to the 3rd floor. We quickly aborted the idea and headed for the stairs for our ascent. Quickly realizing, at the 4th floor, gates and fortifications of the most curious workmanship. This type of defence was never before seen by our people and our wit was unmatched. Like lost sheep we wandered to and fro looking for the strait and narrow gate by which we may find relief. Finding broad and confusing walkways which lead to dead ends, we cried for relief to the security's captain. We plead that we may find a outcropping high above that we may look upon the land of our inheritance and our people. He replied, "Nay, for there is no such place". We quickly left finding no relief to our ideas and adventures. So we did have transfer calls this week, Elder Grow is leaving, and a new guy is coming here. This week we have had a ton of referrals and new people to teach. Things are starting to get crazy. T is progressing quite well. She has come to church this whole transfer, but is still deathly afraid of water and she wants to be baptized, I'm not sure what is going to help her. Brother H has really turned around. He wants to be baptized as well as his girlfriend, but they are not sure about getting married. People have been coming out of the wood works. We have so much to do this week. Just last night we were at dinner with D, We got a phone call from Sister S. She is a less-active we are working with to come back. She called us and told us that her friend wants to get baptized, just out of the blue. Crazy. I had a sweet idea this week. I think I will make a tie quilt with all of my mission ties. The last 2 areas I have been in, I have gathered 3 fold more than what I used to have. They are all polyester ties so they are perfect for a quilt. Is it even possible to make a tie quilt? Just a thought. I will probably go to the dentist next week when we have the car. THANKS FOR ALL THE BIRTHDAY WISHES!! You will have to thank every one in the ward that wrote me a card. It was awesome. There was some people that I didn't recognize, it sounds like there are a lot of new people in the ward. I also received a surprise package from Elder Phillips and Elder Benett yesterday. Elder Phillips crocheted me a beanie and Elder Benett sent me a super cool tie. 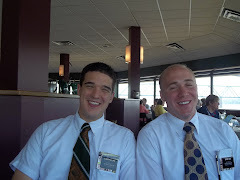 They also sent me pictures of 2 people that got baptized that Elder Phillips and I were working with. It's been a sweet birthday so far. In the plans for today, the AP's are going to take us out to lunch pretty soon, we are going to get some awesome Des Moines pictures, better than the ones we got before, and we are going to hike to the tallest point in Iowa. There is a skyscraper downtown that is like 50 stories tall. Word on the street is that it is the tallest point in Iowa, which I believe from serving in the outside areas. The missionary record stands at the 37th floor, before security find you and kicks you out. It's a missionary legend that there is a rich mans club on the top of it, or an observation deck, or a restaurant... we are not sure but we are going to conquer the urban mountain today. So I sent a box home the other day maybe you already got it, but there is a camera card in there and I wrote on it to keep it for now, but I remembered that I need it back so I can add pictures for the slide show when I leave. There is some cool stuff on the card though, I made a music video with Elder chamberlain right before I sent it. There is a bunch of random stuff in the box, and there is a present for mom. I went to the dentist this week for the teeth cleaning, what a nightmare. I really don't care for dental work so for my whole mission I have brushed and flossed every day, every day, but they said that I have 2 cavities and possibly 2 others. I was really upset with the whole thing. Some crazy things have happened in our area. The other day an old investigator that we dropped a few weeks ago called us. He had a wake up call, and he wants to come back. A friend of his girlfriend got into a argument with her. Long story short, this friend had a boyfriend that just got out of jail and came to their house and pulled a gun on him for this argument. The cops were called and a police chase ensued and the guy went back to jail. He has a hard time since he lives in the hood, but he doesn't want to be a part of the hood. They both want to be baptized within a month. Cool stuff. Things are getting better with Elder Grow. We slayed a dragon the other day while we were tracting. It's missionary talk which basically means that we tracked into a guy that wanted to bash with us, so we pulled out our scriptures of truth, our sword of the spirit and the testimonies of an unconquerable restoration and slayed the dragon of false doctrine and carnal security. It was most excellent. I think we bonded a little more after that. We had a sweet p-day yesterday. We went to the Cubs game. I'm not much a fan for baseball but a member gave us some free tickets so I couldn't pass it up. Things are getting better here. Elder Grow and I are having a great time together. Our area is struggling. This week we dropped our most solid investigator. She keeps giving us the run around, but sincerely knows everything is true. This is one of the main problems we have in this area, people that will not keep commitments. It's a rough area with rough people with many problems in their lives, with a lifestyle that is run from moment to moment. No forethought or goals are calculated into their life, but more temporal matters such as where is the next meal coming from and where are they going to be sleeping tonight. It is next to impossible for someone to have spiritual growth if their temporal needs are not met. This week we are going to be looking for the prepared people to help establish this branch. 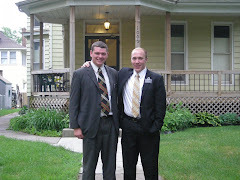 The AP's are in our branch and share the area, they had 2 baptisms this weekend. It was a very powerful spirit. I don't think that I told you but there is also a senior couple in our branch. Elder and Sister Jahn. They are feeding us tonight, way cool to have so many missionaries. 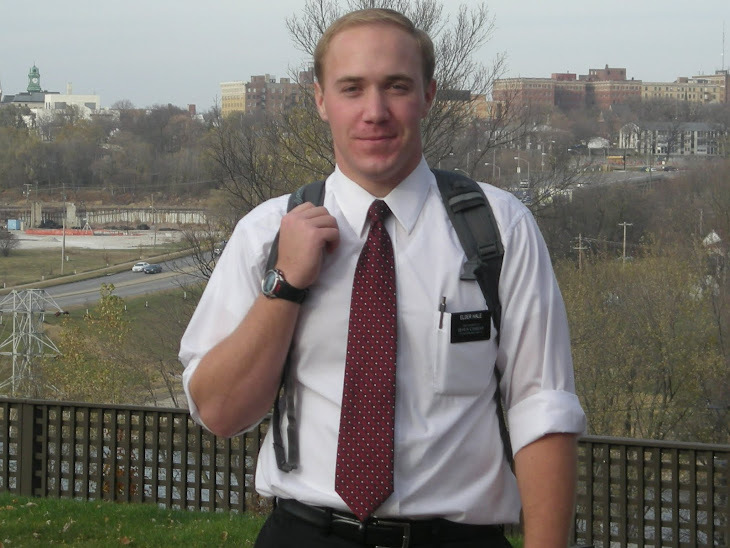 Elder Grow's foot healed up very well this week. We have been on foot most of the time because it hurts him too much to ride a bike. He has actually been in the area for 4 months and knows the town pretty well. I don't remember where he is from though, a small town outside of salt lake. As for my birthday, I don't really know. I would like more books but I have all the approved books that a missionary can have. I don't know, we shop at wal-mart all the time so a gift card would be cool. Honestly, I don't need anything. Now Christmas time I will need a few things so maybe we can roll some things over until then. As for college, I was thinking about Paradise Valley or Scottsdale Community for school, any where with a good institute program. That might narrow it down, THANK YOU for doing this, I just want to make sure I hit the ground running when I get home.